« Final performance at the Farmers Market! 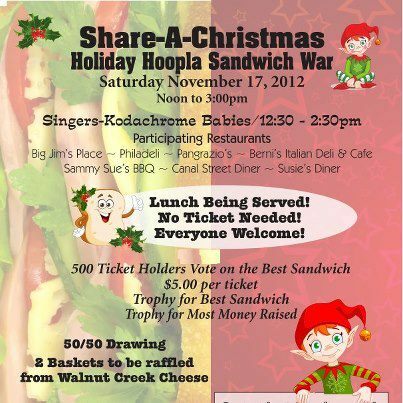 Please join us at this fundraiser for our local Share-a-Christmas! The event is free, but they are selling $5 tickets (and Hannah and I have a few to sell as well) that will get you a sandwich from each of the participating restaurants or you can just buy lunch from any restaurant. The participating restaurants include Big Jim’s, Philadeli, Pangrazio’s, Berni’s Italian Deli and Café, Sammy Sue’s BBQ, Canal Street Diner and Susie’s Diner. We will be playing from 12:30-2:30pm, but feel free to stop by just for a few songs and some delicious food. It’s for a very good cause!